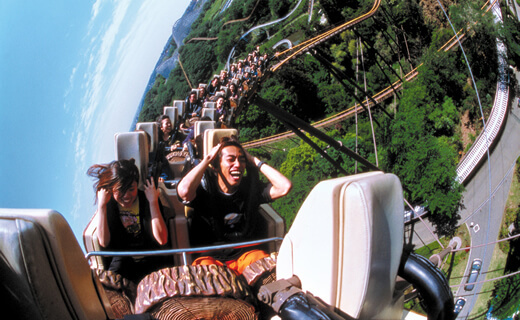 Get adventurous and go on an exploration outside of the central Shinjuku area. There are lots of great places along the Odakyu Lines that locals love but that still haven't been much discovered. For example, the 380-year-old temple Gotokuji, which is overrun with beckoning cats, can be reached with a 15-minute ride from Shinjuku followed by a 10-minute walk, and a museum dedicated to Fujiko・F・Fujio, the collaborative name of the manga artists behind the world-famous "Doraemon," is about 20 minutes from Shinjuku. And if you go just a bit further, you can eat delectable fresh seafood at Odawara Fishing Port. Calling all cat lovers to Gotokuji! Gotokuji is said to be the birthplace of the Japanese maneki-neko (beckoning cat). The temple is filled with these adorable figurines and a giant maneki-neko even greets people as they come out of the ticket gate. The business district in town is also filled with the cats, placed to invite passers-by into their stores. The air here is filled with an atmosphere of times gone by. Take a stroll through town with the cats and find some great local products and fun places to visit! According to a legend, the auspicious temple Gotokuji is where the custom of the maneki-neko (beckoning cat) got started. In the seventeenth century, Ii Naotaka, the second lord of the Hikone Domain, was passing by the gate to the temple grounds when a pet cat waved at him to come closer. No sooner had he come to the gate than the skies broke out in thunder and lightning, and the lord was saved from the torrential rain by the overhang of the gate. The beckoning cat has since become a symbol of good fortune and a way to draw people into stores. And Gotokuji, with its beckoning cats, has become a well-known place to visit. Every year, a sumo tournament is held here. It is traditionally said that the wrestling bouts determine whether the next year would bring a bountiful harvest or famine. To this day, the maneki-neko (beckoning cat) is the symbol of this town. You will find them around the station, decorating storefronts and even street signs. And they make you feel welcome, true to their beckoning nature. 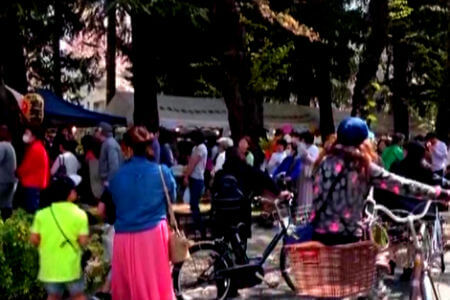 The area has become so well known that people from abroad also often visit. This is a popular area filled with hip stores selling all sorts of goods, small theaters, and clubs offering live music. Shimo-Kitazawa is well known for being deep at the heart of music and other subculture trends. Make sure to check out the back streets, too, which are lined with used clothing stores selling high-quality fashion and restaurants that are all the rage. This shopping district has many shops with an original flair. Many of them are an important part of the fabric of life here, and there are also many temples in the area. An aspect of the area that should not be overlooked is the new cafés that have appeared and the so-called shutter gallery made up of artistic murals decorating storefront shutters. The district association pays for the painting supplies and training, and the youth association puts on the paint base so that art students and designers can volunteer to make works of art as a way to practice their skills. Shimo-Kitazawa is one of the best used clothing districts in Japan, and the vintage shops are too numerous to mention. Whether it’s low prices or something you can’t find anywhere else, there’s a shop for every taste in fashion. Enjoy shopping while out for a stroll! This shrine is located about a 15-minute walk from Shimo-Kitazawa Station. 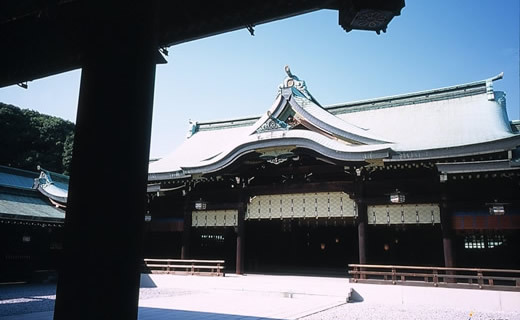 It was constructed to house a tutelary deity that, in order to protect the northern end of Setagaya, underwent spiritual division and transfer by the Kira clan that ruled the area. A community institution beloved by the locals, the shrine has giant koi windsocks flying on the grounds. Their well-known Reitaisai festival is held on the first weekend of September each year. 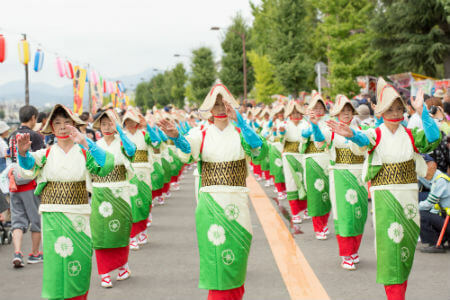 The festival program includes a variety of events such as the wadaiko (Japanese drum), ohayashi (traditional music ensemble), Edo kagura (ritualistic dancing and singing), classical gagaku music and miko dancing. When the Obon season of August comes around each year, awa odori dancing breaks out at the Shimo-Kitazawa Ichiban-gai shopping district at the North Exit of Shimo-Kitazawa Station. Cultural institutions that are the pride of Japan to the world are concentrated in this corner of Kawasaki that still retains must nature. Famous manga artist Fujiko・F・Fujio lived here for many years, and artist Okamoto Taro was born here. Experience world-class culture in museums with vast collections of works by these globally famous artists. They are located in Ikuta Ryokuchi Park that is also home to a natural history museum, institutions with cultural assets and much more. Cultural pop monuments greet visitors at the station and along the way to the park. Experience traditional aizome (indigo dyeing) for yourself (a fee applies). Located in Ikuta Ryokuchi Park, this museum has lots of exhibits focusing on the theme of nature in Kawasaki. And don’t miss the popular planetarium with its world-class projection system! If you want to go on the weekend, make sure you arrive early as the tickets often sell out before noon. Located at the end of a stylish brick-laid walkway, the Tama Center building is so colorful, it seems to be from a different country. Fluttering flags and information boards are decorated with cute pop culture characters. The excitement you get just from walking through town, that’s Tama Center. A variety of facilities have been brought together here for fun, including Sanrio Puroland, where you can meet Hello Kitty and other familiar characters, and venues for exploring art and nature. And the beautiful lights that decorate the center each winter are a popular mainstay of the season. The flowers that bloom through each season of the year are a point of pride of this park, and it is the perfect way to spent a leisurely day. In summer, kids run about and play on the grassy lawn around the fountain. Each winter, including during the Christmas season, Parthenon Boulevard is lit up with some 400,000 lights from Tama Center Station to Tama Central Park. The splendid decorations are a fixture as one of the great event events near Tama Center Station. After flourishing as a castle town during the Sengoku (Warring States) period, Odawara was one of the most prominent shukuba (post towns) on the Tokaido, a major thoroughfare for Eastern Japan. The traffic that came through added to the development of local traditions and culture. Odawara Castle radiates in beautiful white as a symbol of the town. The many sites where you can get a sense of the history include historical ruins and shops that have been in business for centuries. If you go a little further out, you can visit Odawara Fishing Port, where you can find restaurants serving fresh fish and gift shops. A 1-minute walk from JR Hayakawa Station, one station away from Odawara Station, this town has the hustle and bustle of a busy fishing port early in the morning. There are many places where you can find fresh fish to eat! 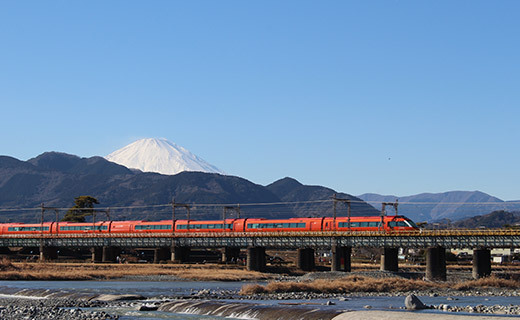 "Greater Tokyo Pass" is a Plan Ticket which allows unlimited rides for 3 days on railway lines and streetcars operated by 12 companies and ordinary fixed-route buses of 52 companies in the Kanto area. 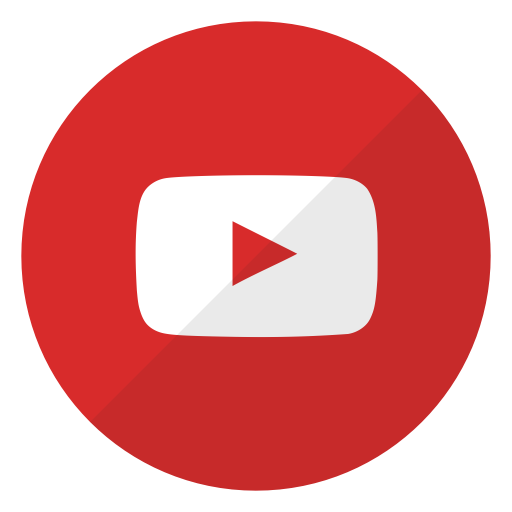 *During the campaign between Saturday, March 16 and Tuesday, April 30, 2019, the period of usage for this pass is extended from 3 days to 5 days. 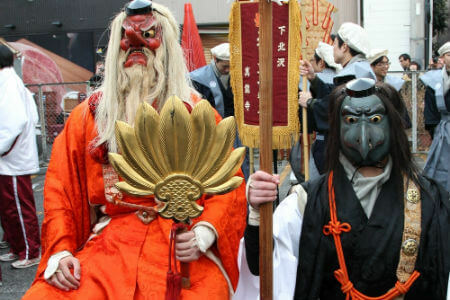 This festival that has been handed down for generations to celebrate the changing of seasons is held at a temple in Shimo-kitazawa where the Tengu is worshipped. The Great Tengu and Scarecrow Tengu march through the Shimo-Kitazawa shopping district while tossing roasted sacred soybeans for good luck. On the evening before the big festival, the Scarecrow Tengu and Buddhist hermits and others, make the rounds at the restaurants and bars in Shimokitazawa. 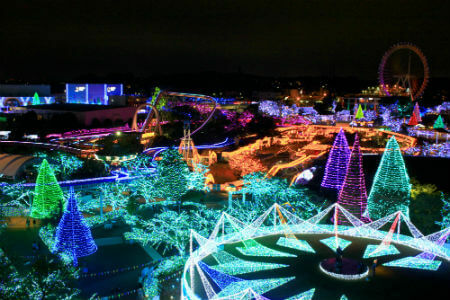 The word “Jewellumination” is a blend of “jewel” and “illumination.” It is one of the largest light displays in Tokyo with 5.5 million LED lights. A harbinger of spring, the 360 early-blossoming cherry blossom trees are particularly spectacular at night. Do know of anywhere near Tokyo where you can enjoy cherry blossoms in full bloom a whole month before the cherry blossom viewing season begins? 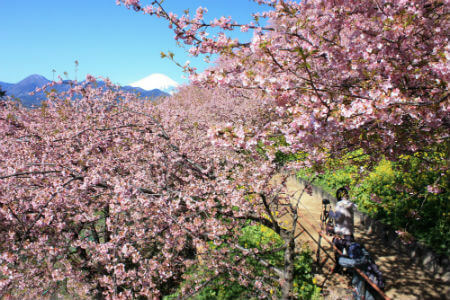 At Nishihira (or Nishihirabatake) Park in Matsuda Town, Kanagawa, the kawazu zakura come into full bloom in February and March. Starting around the end of February, the cherry blossom trees are lit up in the evening, and the combination of the kawazu zakura seeming to float in the night air with the night scene below has a mystical flavor. At the Matsuda Cherry Blossom Festival, which is held when the cherry blossoms are in full bloom, you can buy famous local products and people of all ages come to enjoy the many events held, including the tea ceremony and other Japanese cultural functions. 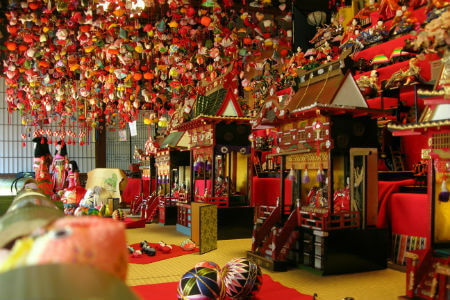 The Seto Yashiki Hina-Matsuri festival got its start as an event sponsored by the town women’s association at the Ajisai Park Dance Hall in 2003. In 2005, the event moved to the Seto Yashiki (Mansion), where it has been held as one of the venues annual events ever since. 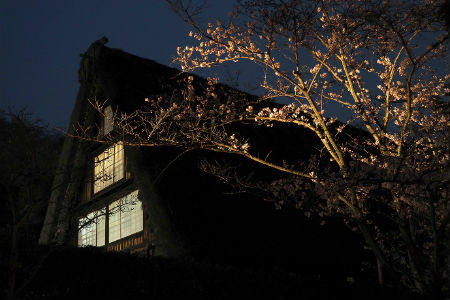 The folk houses in the Japan Open-air Folk House Museum will be illuminated twice a year, in spring and in autumn, extending opening hours. You can enjoy dreamlike view of the houses in the dark with seasonal flowers, spring cherry blossoms and autumn maple leaves. We offer the visitors the paper lanterns to lit at their feet (to be cancelled in case of rainy weather). You can view the demonstration of night works, listen to the folk stories, and warm yourself sitting around a sunken hearth. The fountain and lakeside areas at Sagamiko Park are bathed in beautiful illumination. The reflections in the lake water are mesmerizing. Held each December. A cherry blossom festival is held each year on Ultra North Street which is lined with Ultra Seven-styled streetlamps to the north of Ultraman Shopping District. November 3 is the lively day of the Japan Open-air Folk House Museum, and it is the day when the museum is open free. 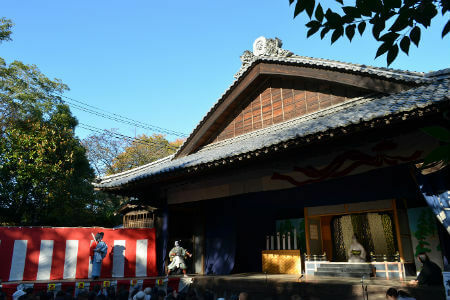 There will be some the special events: the demonstration, display and market of the traditional crafts; the fascinating workshops of experiencing the old time, especially attract children; and the rural performance at the Kabuki Stage of Funakoshi, designated as ethnocultural asset (we charge for tickets in order of arrival). You can enjoy various programs in one day at this Minkaen festival. 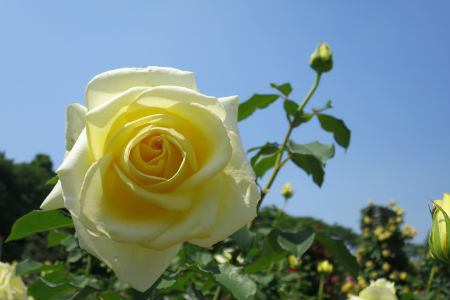 When you emerge from the Tama Hills woods, the secret Rose Garden at Ikuta Ryokuchi Park will suddenly come into view. The garden boasts 4,700 rosebushes in 530 different varieties. Enjoy the roses of the season, shining in the soft sunlight. The Rose Garden can be visited only during the spring and autumn openings. 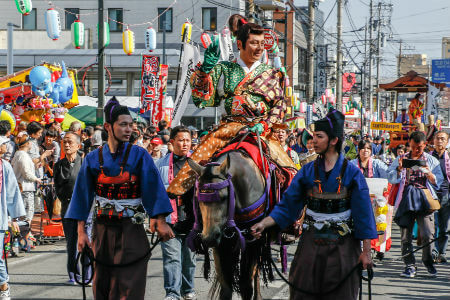 The largest Hojo Godai Festival in Odawara. Some 1,700 people in total participate in this parade, including those in the samurai unit, the firearm corps, the school wind instrument club, the school baton team and more. It is held on March 3, a holiday. 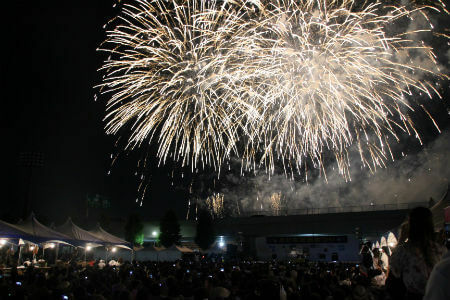 The largest event in Isehara. 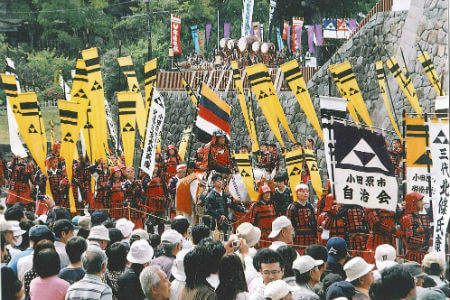 This festival is named for OHTA Dohkan, who is known as the architect of Edo Castle and ended his life in Isehara during the Sengoku Period. Drawing more than 200,000 people every year, this is the largest festival in Hadano. The city once produced leaf tobacco said to be one of the three greatest varieties in Japan. To make sure the dedication that earlier generations had for tobacco is remembered and passed on to the younger generation, the Hadano Tobacco Festival is held on the 4th Saturday and Sunday of September each year. 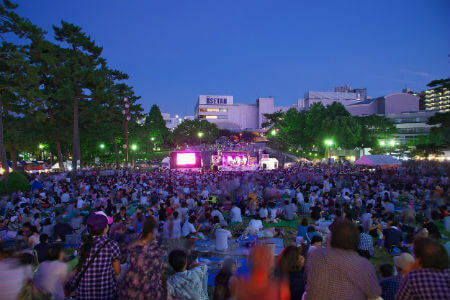 The largest summer event in Sagami-Ono. The food and beverage stalls present wonderful local flavors that are the pride of Sagami-Ono, and there are live performances on a stage. The Sagamiohno Foodfesta Mangez is held in Sagamiono Chuo Park. This festival is held in Ebina. In addition to various stage events in Ebina Undo Park, there are about 100 different booths set up. With only 300 meters between the launching area and the viewing area, the fireworks show is a stunning display. 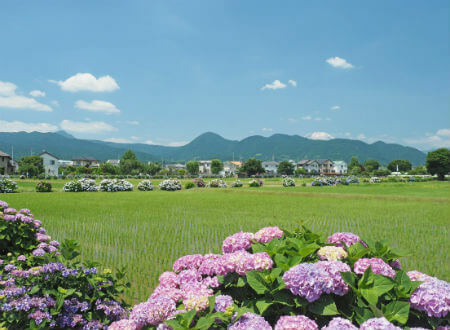 Some 5,000 hydrangeas are cultivated along Rainbow Road, the “Hydrangea Village.” Against a backdrop of the natural colors of rice paddies, the hydrangeas project exceptionally beautiful colors.